Much less demanding than annual form. Deadhead to prolong bloom. Division is not necessary and is rarely successful. 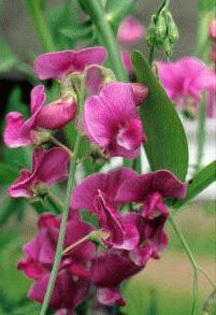 Perennial pea is another old-fashioned favorite valued for its lovely habit and supply of cut flowers. It is much less demanding than the annual form of flowering pea. Like garden peas, perennial pea is a vining plant that is best given support such as a trellis, pea sticks, or a fence. The flowers range from white to pink to reddish purple. They are carried in sprays on the ends of stiff stems. They flower in early summer. Division to maintain vigor is not necessary. In fact, division can be tricky and plants are best left undisturbed except for propagation purposes. This can be done either from division of roots or by taking cuttings from young shoots. Both are best done in the spring.